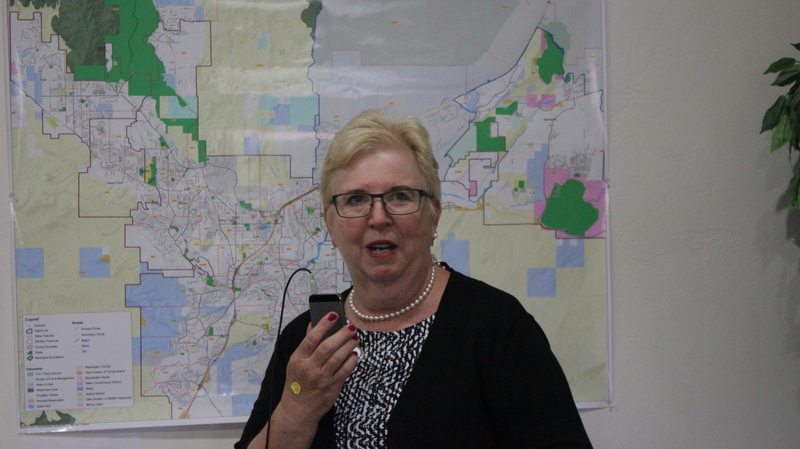 ST. GEORGE — Dorothy Engelman continued her quest to disrupt the status quo in Southern Utah Thursday night with the official start to her campaign for Utah Senate District 29 seat Thursday night. The event was also the grand opening of the new Washington County Democratic Party headquarters at 455 N. Bluff St.
Engelman will be running against Rep. Don Ipson – currently representing House District 75 – for the seat being vacated by Sen. Steve Urquhart. She was very excited to be running for the Senate, she said, adding that the fact there is no incumbent in the seat makes the race all that more intriguing. “I really felt that this was really a great opportunity for me to be able to take what I learned from the 2014 campaign when I ran for House and put it to better use and really make a change here in Southern Utah,” she said. Engelman ran for the Utah House of Representatives District 74 seat in 2014 but was defeated by incumbent Lowry Snow. With an audience of approximately 40 people crammed into the small space Thursday, Engelman spoke about her campaign. 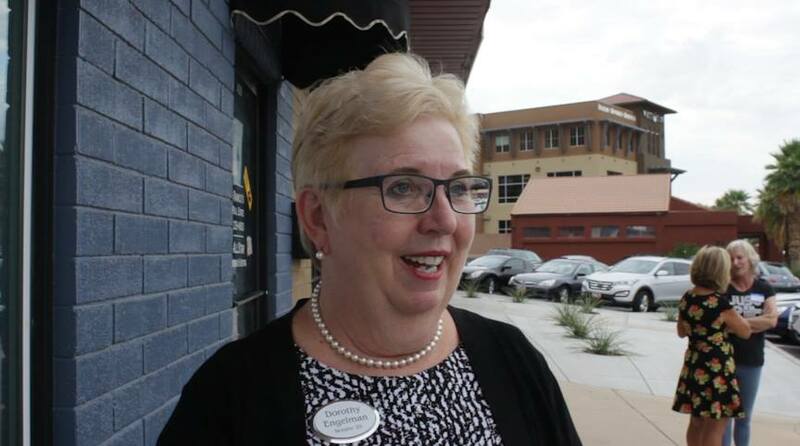 Engelman also said that she considers herself a “different candidate” rather than a “better candidate.” That makes a difference, she said, because her ideas are not more of the same recycled ideas touted by most local Republican candidates. Jerry Salkowe, finance chair for Engelman’s campaign, also spoke about her efforts to make headway in a historically Republican area. He said that changing the trajectory of Southern Utah’s conservative leanings won’t happen in a year or two but will require a decade of work and lots of money. “Dorothy’s done some really incredible things drawing in funds from places that I didn’t even realize were out there,” Salkowe said, adding that she has been thinking outside of the box with her advertising on buses, electronic billboards and even her car, which is decorated with oversized “eyelashes” on its headlights. The most important thing in this election cycle, Salkowe said, is getting Democrats to register and vote, something that can be difficult in an area that has almost always exclusively voted Republican. Chuck Goode, who is running for State Representative in District 71, also spoke before the gathered local Democrats. “If we had Dorothy in the Senate, it would make such a difference in this state,” he said. The Republican party in Utah espouses ideals that everyone believes in, Goode said, but all too often those ideals are not truly upheld. He cited Utah’s low national rankings in education funding, employee wages, equal pay for women, lack of family leave and no Medicaid expansion as examples of Republicans failing to support the people of Utah. “That’s not putting people first,” he said. 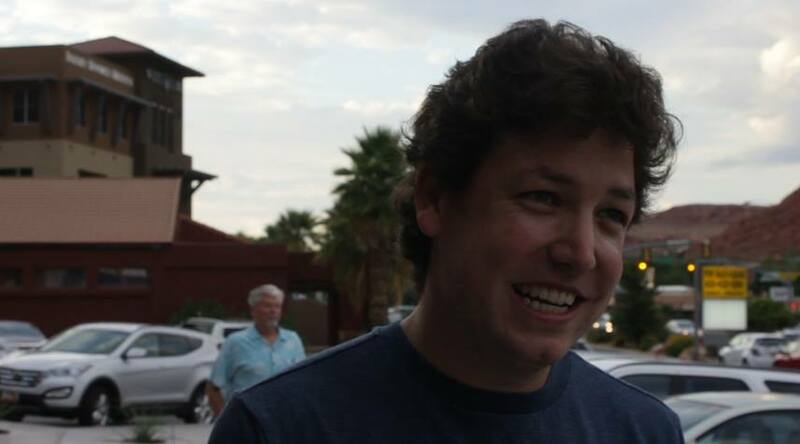 Zach Almaguer, chairman for the Washington County Democratic Party, said that Engelman’s previous run for office was going to be a big boost for her current campaign. “We’re ready to stick it to them. We have two really strong candidates,” Almaguer said, referring to Engelman and Goode. The grand opening of the Washington County Democratic Party headquarters means a new space that will serve as a hub for not only Engelman and Goode but also for the other Democrats running for office in Utah: Mike Weinholtz for Governor, Jon Harper for Attorney General and Charlene Albarran for United States Senate. The biggest challenge for Democrats in Washington County is that they have no voice in the system, Almaguer said. I didn’t know there were any liberal lemmings in StG. Everyone with a Sanders/Clinton/equality sticker. There are more every day, moving in from California. And don’t forget rainbow dash and her entourage. What phone booth is the Democratic headquarters in? I tip my hat to you, good sir.